Synopsis: When a mysterious package is delivered to Robin Ellacott, she is horrified to discover that it contains a woman’s severed leg. I love these books, they draw you in, entrap you and leave you with that tingling sensation! I thought the first was fantastic, the second not so much and now back for a third installment shot right back up there! It was a great book and shaking the format up a little was great touch. For here for the first time we have the inclusion of the killers perspective. This first person perspective dotted throughout the book added a whole new layer of enjoyment, and you got to explore the more gritty side of crime writing. It was also nice to have this new perspective so your getting both sides and creating this bigger picture because the atmosphere was different, the mystery of who it was, with all the red herrings dotted throughout. There is such a fluidity to the writing I love the style the tone, and though it took me a while to actually go through the book I also enjoyed that because that meant I wasn't just done with it and like an actual crime case you get bits piece by piece and the book was real and with me for a good period of time. Yes there were some flat bits and maybe that's why it took me a little longer. but there was also depth and the books, especially this one was so much more about the crimes, its about the people and their lives. I was very scared or one moment that Galbraith was going to disappoint me and go down a traditional cliche route, but true tot form the twists and turns kept coming. 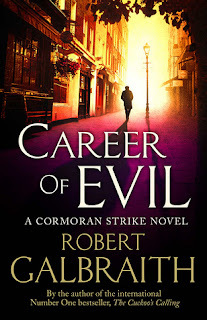 Robin and Cormoran are booth equally enjoyable characters and I enjoy both their sections (if not Robin's a little more sometimes). You want to fight Robin's corner with you and that's a strong connection to make with these characters. In the way that Stephen King build his books and these worlds here the characters are built and developed as as much as you see their professional lives, their personal re intwined so much especially in this book. You get this with crime books yes, to varying levels of success, but I'm not sure I have been this invested in a character's life for a while.. The only problem is now that It's over I'm sad and want more!! But I'll see you next year eh, same time same place with the next story (fingers crossed).